Most people think of Shaquille O’Neal, widely-known as Shaq, as a basketball legend and NBA analyst and television personality. What many don’t know is that the former NBA great is a geek at heart. “I’m on my iPad and on my computer every day. I’m proud to say I’m a geek,â€ Shaq said. The 7-foot-1 superstar revealed his inner geek during his debut appearance at South by Southwest (SXSW). Hosted by social media personality Brian Solis, the four-time NBA champ spoke about his love for all things digital at “Shaq Goes Social: The Big Interviewâ€ on Monday at the beautiful Long Center for the Performing Arts in Austin, Texas. O’Neal was introduced to computers by one of his mentors, who he nicknamed “McDougal,â€ and his love for technology continued to grow. 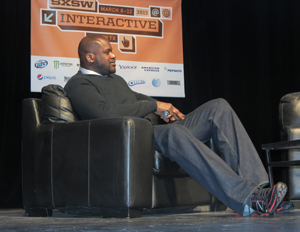 Â “I always wanted to be at the forefront of what’s next and what’s at the forefront of technology,â€ stated by Shaq to the audience at SXSW. Over the years, he has invested in several startups. Â But O’Neal is not fixated on the money. “The most important thing for me is if I’m helping someone,â€ said the former b-ball player. “Would this tool be able to make a difference? That is what matters most to me. But I do love those nice hits like a Google.â€ His current investment portfolio includes Five Guys, Vitaminwater, Muscle Milk, and video technology company Tout. Shaq constantly uses Tout, a mobile app that allows users to create a 15-second video clip and share it with their network. “With a company like Tout, it enables me to show everyone that it’s really me and that I’m authentic.â€ O’Neal used the platform to announce his retirement from the NBA; thus driving over 500,000 visits to the platform and tons of media. The influencer factor has caused more celebrities to utilize the platform. The father of six is no stranger to the success and power of social media. With 6.8 million followers on Twitter, he is a major force in the space. According to him, he uses the platform within a “60% to make you laugh, 30% to inspire you, and 10% to sell stuffâ€ formula. As for Tout, O’Neal has partnered with the San Francisco startup to launch a pitch campaign, “Pitch Shaq,â€ a few weeks before announcing he’d be descending on Austin for the festival. Registered SXSW attendees were encouraged to use Tout’s functionality and submit 15-second elevator pitches. The winner would receive support from Shaq and potential investment toward their startup. Follow BlackEnterprise.com’s coverage of 2013 South by Southwest (SXSW) at blackenterprise.com/technology.